- Component 3: Project management, monitoring, evaluation and auditing. - Integration of environmental and social measures in all stages of Project implementation. - The area of Lim River Basin is 5,785 km2 (of which 2,880 km2 belongs to Montenegro). - The Lim river flows by Andrijevica, Berane, Bijelo Polje, Prijepolje and Priboj. - The total river length is about 220 km (in Montenegro is about 94 km). 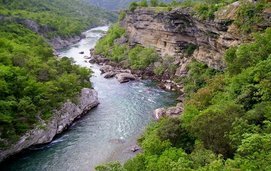 - In the Bijelo Polje river width is 45 m and river depth is 2 m; near Prijepolje, width is 60 m, depth is 2 m. At several places in the canyons, the width of the river is only 3 m.
Detailed designs for selected flood protection structures on the Lim and Grnčar Rivers, including surveys, engineering calculations, drawings, bill of quantities, technical specifications and all other relevant documentation, prepared in accordance with the best engineering practice and in the format prescribed by national legislation. Plan for future exploitation of sediments (gravel and sand) from the riverbeds of the Lim and Grnčar Rivers.